Stress is overwhelmingly affecting people in our society today. Busy with work, home, family, and many other daily tasks - stress piles on without our realizing it. Stress Management Reiki. That's why so many people are turning to the stress-reducing techniques used in Reiki, a spiritual energy used with healing, meditation and spiritual growth. When a person is introduced to Reiki, an initiation takes place called "Reiki Attunement." This brings the person into a relationship with Reiki energy, and is usually activated by a trained Reiki master-teacher. During a Reiki Attunement, the person's dense energy is cleared and released, and etheric and chakras fields are strengthened so the person will be able to receive and transmit high frequency healing light. The person can become familiar with Reiki healing and Reiki symbols as well. Stress usually takes over when a person is fearful, doubtful, or full of worry about things that are happening around them. The person often lives in a constant tense state without realizing what is happening. The body naturally reacts with fatigue, moodiness and sometimes, disease. To relieve stress, one must learn to relax and overcome the fears and worries of everyday life. Reiki helps a person to relieve the emotional and physical strain of stress and to restore balance to the body, soul and mind. The person can return to a relaxed, peaceful state of being by clearing energy bodies and unblocking meridians, chakras and nadas. There are several methods used in Reiki to reduce and eliminate stress. 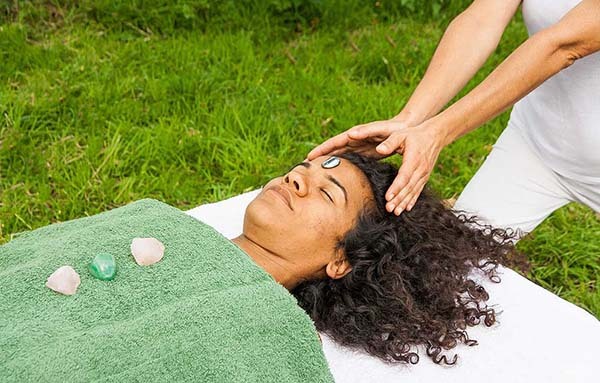 One method is crystal healing, where crystals or crystal bowls are used to create sounds of healing and relaxation. The crystalline sounds carry Reiki energy deep into the body to enhance the relaxation process. Tension is released and the body begins to relax and respond to the Reiki energy. The crystal sounds promote deep tension release in the very cells of the body to create stress reduction from within. Crystal bowls are available in different sizes and can be tuned to any note desired - flats, sharps, or pure tones. Another method of Reiki stress management is through healing drumming. Healing drumming introduces Reiki energy to a person's body by the use of a drum beat. The drumming helps to create a deep, relaxing state as stress is relieved. There is a deep connection between the physical body, spiritual being, and the mind. Stress affects all three in a negative way. Using Reiki techniques for stress management is one way a person can lead a more relaxed, peaceful life.